Think of organizations as human bodies, not hierarchical pyramids. Bodies are agile. Pyramids house the dead. Organizational leaders try to increase speed and agility by removing layers from pyramids. But removing layers – creating flat organizations – doesn’t transform rigid pyramids into agile bodies. 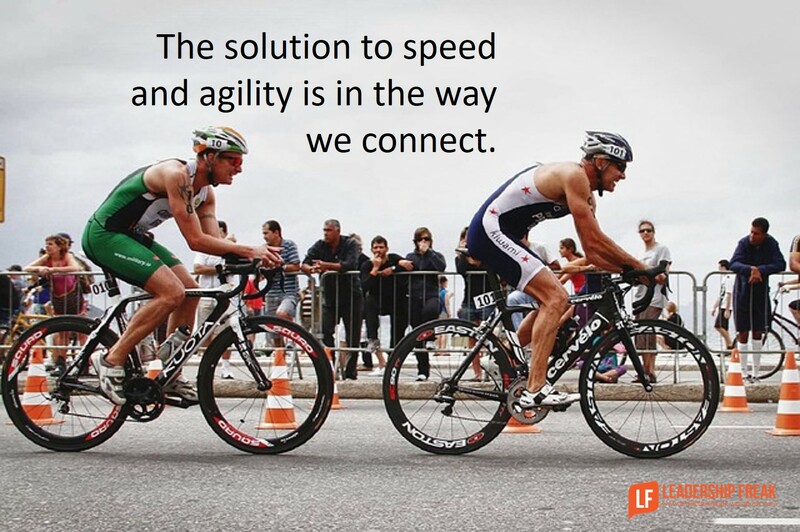 The solution to speed and agility is in the way we connect. Trying to ‘flatten’ an organization always fails unless connections are strengthened at the same time. #1. Individual parts matter, only in connection to others. A foot in a box is novel, but useless. #2. Isolation and disconnection are the ultimate offense. Disrespect for connection offends the very nature of ‘organization as body.’ Arrogance is to believe you can succeed in isolation. #3. Effective movement is a function of joints – connection. Flat organizations require strong connections or they flop about like a pile of fish. Connection enables and guides unified movement. Joints hold bodies together and enable movement at the same time. Joints are both rigid and flexible. Quality of connection determines effectiveness. A joint, the place where individual parts connect and flex, determines speed and agility. Strength of connection dictates how far and high you reach. Hands, apart from arms and legs don’t reach very high. Hard truths only matter when you’re connected. Why bother if you function in disconnection? #1. Respect the strength and contribution of individual body parts, including yourself. #2 Get rigid about your commitment to communicate. Connection suffocates apart from active communication. What channels of communication will you leverage? How frequently will you communicate? How will you evaluate communication? How will you improve communication? How will lack of communication be challenged and corrected? #3. Commit to think of oneself as both separate and connected. Those who stand aloof hide behind pyramids. How might leaders strengthen connections in order to increase speed and enhance agility? Get OFF email as your go-to source of communication. Email is speedy and very effecient, but very in-agile! Get in peoples face, eye to eye, non-verbally. It may create discomfort, but we have already heard the benefits of that. You must create relationships! Thanks Will. I’m glad you took a swipe at email. It’s useful, but not always the best way to develop and strengthen connection. Very good, Dan. I think one of the biggest problems with flat organizations is that you have one leader depended on for communication by too many people. If the hierarchy were not laden with authority, the levels would actually make it easier to communicate. I can talk with 10 or 20 people in a meaningful way every day, but make it 100 or 200 and there’s no chance. Thanks Susan. Your comment speaks to the power off small teams with public forums. However, if the culture doesn’t respect and honor transparency and candor, communication in public ways is a waste of time. I’m remembering my conversation with the CEO of RedHat. They are a very public organization. Decisions are slow but connections seem strong for a dispersed organization. Dan, this is one of your best ever, never mind for this year! The joints, interfaces and overlaps are where the interesting stuff happens, in my experience, and it’s where the fastest learning and quickest wins are often to be found! Thanks Mitch. There is some good research that brief one-on-ones with direct reports are very effective. Perhaps twice a month for 20 minutes is a way to interact. If people are in the same building, a spontaneous encounter in the hallway is useful. We can pay attention to those brief contacts. Dan, I’m not sure if you’ve ever posted about the dangers of “over-communicating”. What are your thoughts on the toxic risks of an excessive “Reply All” culture? Have you ever observed an organization where out of positive intentions, employees were “forced” to communicate more? In believe that communication must be sincere, not compulsory and this can be frustrating and problematic. Would love your thoughts. Thanks jcrivas. I haven’t written about over-communicating, that I recall. The topic you bring up is important because both quality and quantity are factors in success. Email isn’t the best way to communicate to connect, in my opinion. Most emails are too long. In addition, email shouldn’t be used to discuss complex issues. There are tools like slack that enable people to have an on-going conversation in a more natural style. Some organizations have adopted a daily team standing meeting at the beginning of the day. They’re brief and focuses on current issues, things to that need to be shared, success stories, leanings, goals, etc. The term ‘standing’ is literal. Dispersed teams may need to use video conferencing as an option for communication. In general brief frequent conversations serve to keep people connected more than long meetings. Great truth, we are many but one body.